This is a dessert I've had sitting in the recesses of my mind for some time now, but have been waiting for the proper excuse to make. Easter seemed like the perfect time, what with eggs being so central to the festivities, so I held onto it until it finally rolled around. One of my favourite things to do is to make food look like something it's not. It's been some time since I've done that 'trick food' so I couldn't wait for the excuse to delve into this one. I had thoughts of making the egg shell look realistic. But being Easter, I went for something a little more festive. 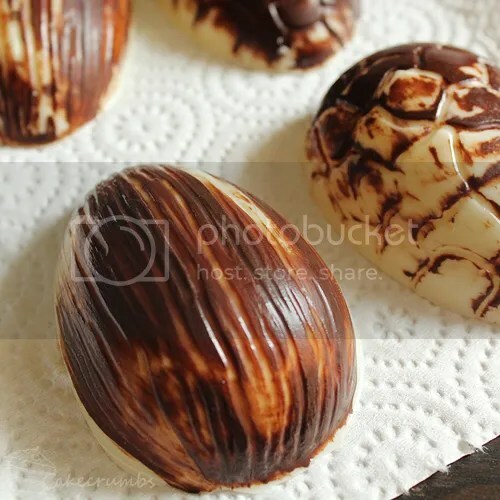 These shells were made the same way as in this chocolate egg tutorial, only this time I reversed the colours so the dark chocolate was on the outside and the white chocolate on the inside. I sat them inside a cupcake tray to help keep them level while I filled them up. They can be a bit tippy when empty, but once they're full the distribution of weight keeps them sitting upright. I put the mousse in the fridge for a moment to let the surface set, then I added a dot of yellow white chocolate mousse and the effect was complete. This mousse doesn't require any gelatine as long as you beat the cream and egg whites properly. If you accidentally over-beat your egg whites or cream it may end up slightly runny so you may want to add a little gelatine. The easiest way is just to pay careful attention to the consistency as you're beating and all will be well. 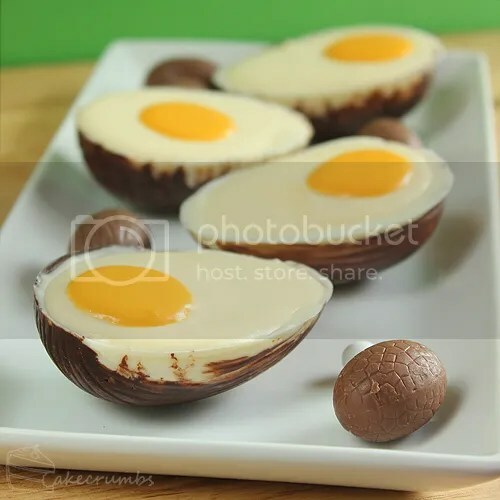 I used 1/4 cup (60ml) capacity Easter egg moulds for this dish. I only made 4, but the leftovers would have filled another 3 or 4 shells. So you're up for about 500ml of mousse. 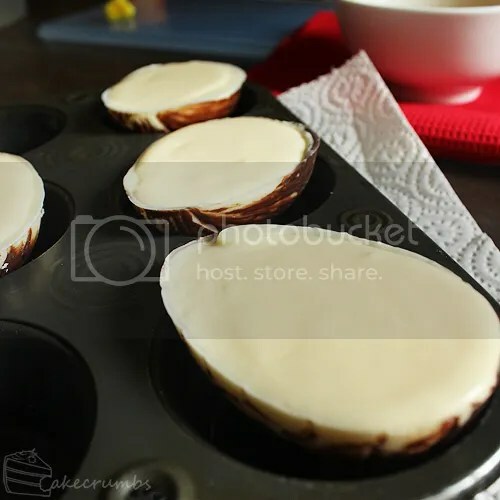 You can use any size mould you want, or even use this balloon technique to make chocolate cups if you don't want to buy moulds. 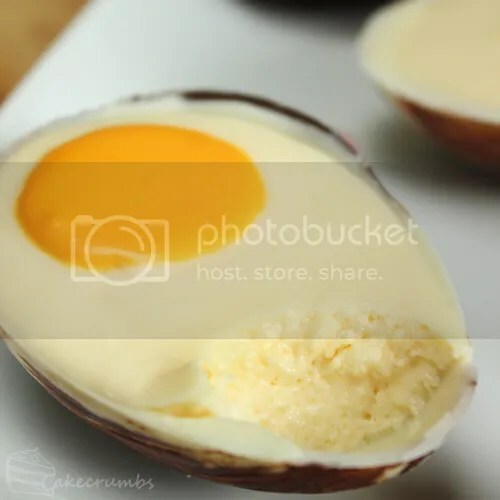 Or if you really don't want to make the shells, just cut some hollow Easter egg shells in half! You probably have tonnes lying around right now anyway. Place the white chocolate and butter in a bowl over a small saucepan of simmering water; stir until melted and well combined. Remove from heat; stir in egg yolk. Allow to cool slightly. Meanwhile, beat cream to soft peak. Then, in a separate grease-free and clean bowl, whip your egg white to soft peak. Fold a third of the cream in to your chocolate mixture to lighten it. Then fold in the rest a third at a time. Do the same with the beaten egg white. Reserve a little of the chocolate mousse and place in a small bowl. 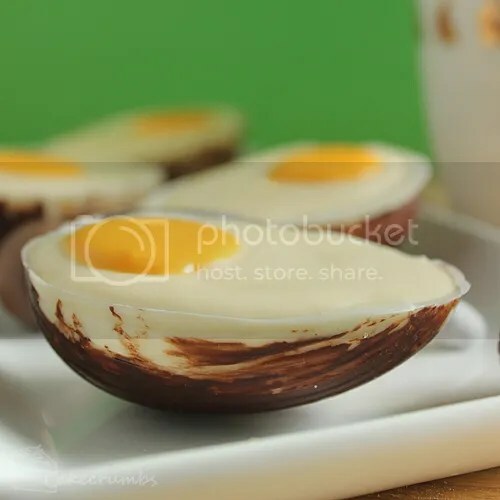 Fill the chocolate egg shells with the rest of the mousse. Place in the fridge. 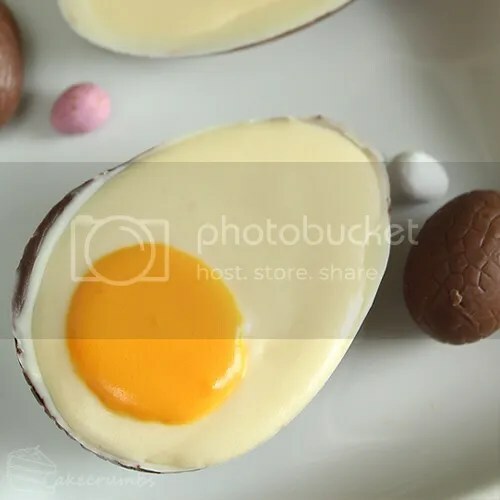 Meanwhile, tint your remaining mousse an egg-yolk colour. You'll want to add about 1 drop of red to every 6 drops of yellow to attain the light orange colour. Remove mousse eggs from the fridge. Using a spoon or small ladle, dollop a little of the yellow mouse onto the surface of the mousse. Return to the fridge and allow to set for 3 hours, or overnight. These look great! Definitely an effective example of ‘trick food’. And more importantly, very delicious.